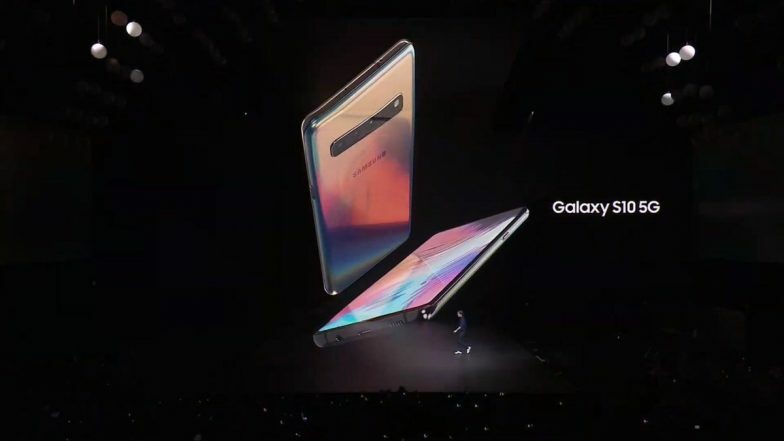 Seoul, April 5: Samsung on Friday launched its first 5G smartphone, the Galaxy S10 5G, in South Korea starting at $1,222, hoping to boost the stagnant smartphone market with the new device designed for the latest mobile network. Three mobile carriers - SK Telecom Co, KT Corp and LG Uplus Corp - started official registration of Samsung's smartphone, Yonhap news agency reported. Samsung Galaxy A20 Smartphone With Dual Rear Camera Launch; Priced in India at Rs 12,490. They switched on the 5G network for a select group of customers on Wednesday. While the 256 gigabyte model costs 1.39 million won ($1,222), the 512 GB version is priced at 1.55 million won ($1,361) in the South Korean market. WhatsApp, Facebook & Instagram Will Not Work on These Phones From April 30; Is Your Smartphone On The List?. Industry officials expect 5G smartphone users will opt for unlimited plans to enjoy high-quality streaming service as well as virtual reality (VR) and augmented reality (AR) offered by the carriers. Facebook Beats Google To Become Hot Bed For Political Advertising Ahead of 2019 Lok Sabha Elections.